On November 24, 2016, Colombia’s government and FARC rebels agreed to end the insurgency that spanned more than 50 years, the longest-running armed conflict in Latin America. 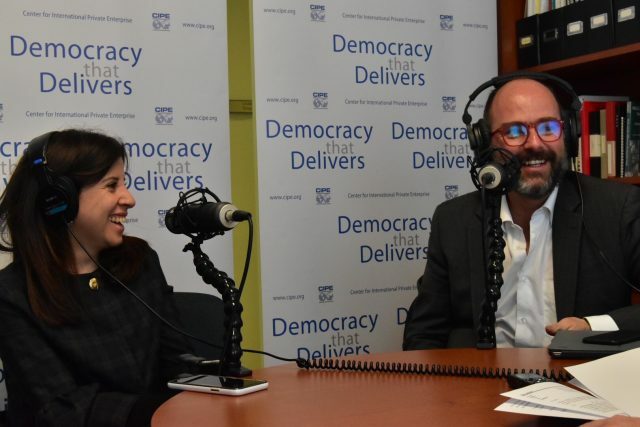 On this week’s Democracy That Delivers, we are joined by two special guests from Colombia. Jaime Arteaga, Director of Jaime Arteaga and Associates , is CIPE’s lead in-country consultant in Colombia. Catalina Chamorro Ortega, Director of the National Business Council of Colombia, joined him as well to discuss what she sees as the changes in narrative surrounding the future of Colombia. This includes changing the focus from security and instability to economic growth, business opportunities and increased investment. Arteaga also stresses that creating legal opportunities for citizens to make a living is an essential step forward for the country’s future development, noting CIPE’s expertise in developing projects to move citizens into the formal sector and ensure good business practices. “Since 2009 the economy has been growing in an important way, and we see now after the peace agreement, there is a greater number of investors that have come into the country,” says Ortega. For more information about CIPE’s work in the country, look for an upcoming post on the CIPE Development Blog. Be sure to listen to our last podcast with Jaime Arteaga, on Democracy That Delivers Episode #89.